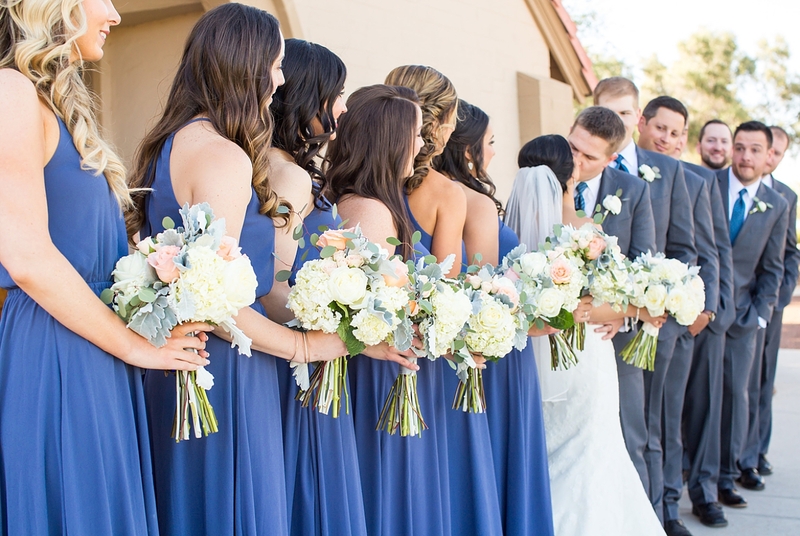 Utterly soft and romantic, Kristine and Eric's blue and peach wedding details are so striking! 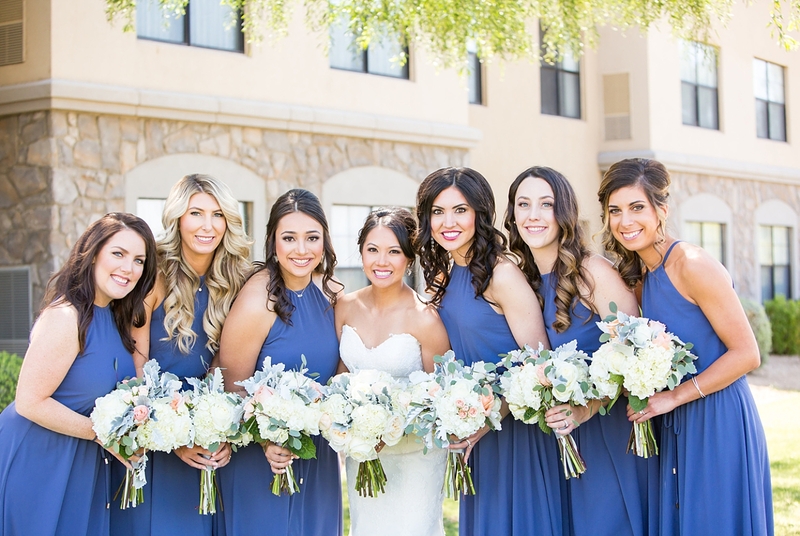 With denim blue, slate gray, and accents of soft peaches and pinks at the helm, their wedding day at Pebble Creek Country Club in Scottsdale has us swooning. 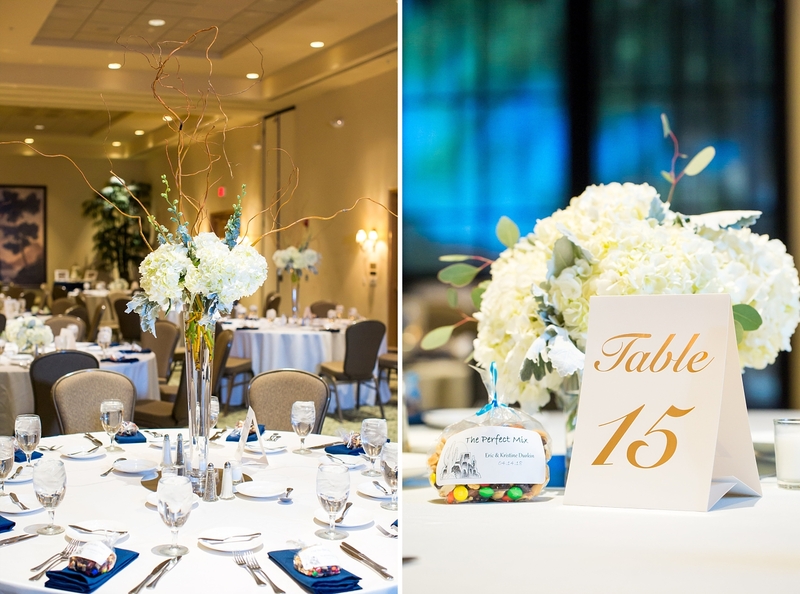 The reception space full of soft florals and light hues is simply elegant. 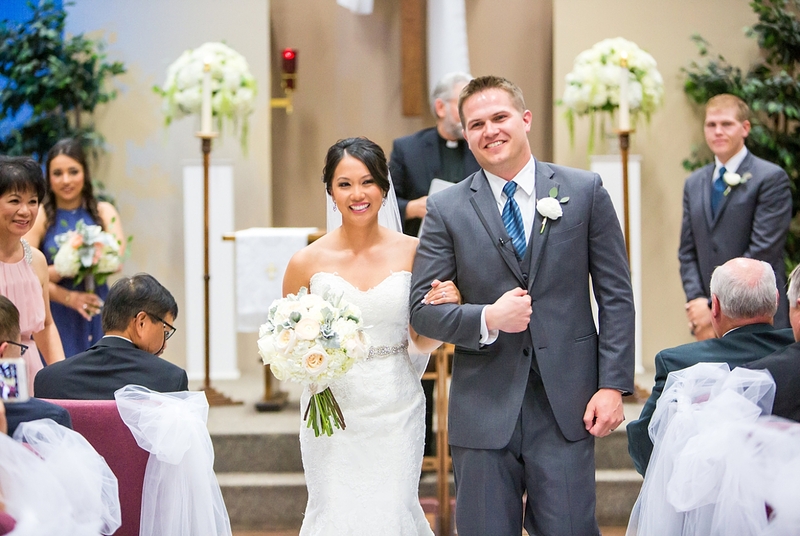 Kristine and Eric got their first glimpe of each other as she walked down the aisle, and you can just feel their joy as they greeted each other as she reached the altar! 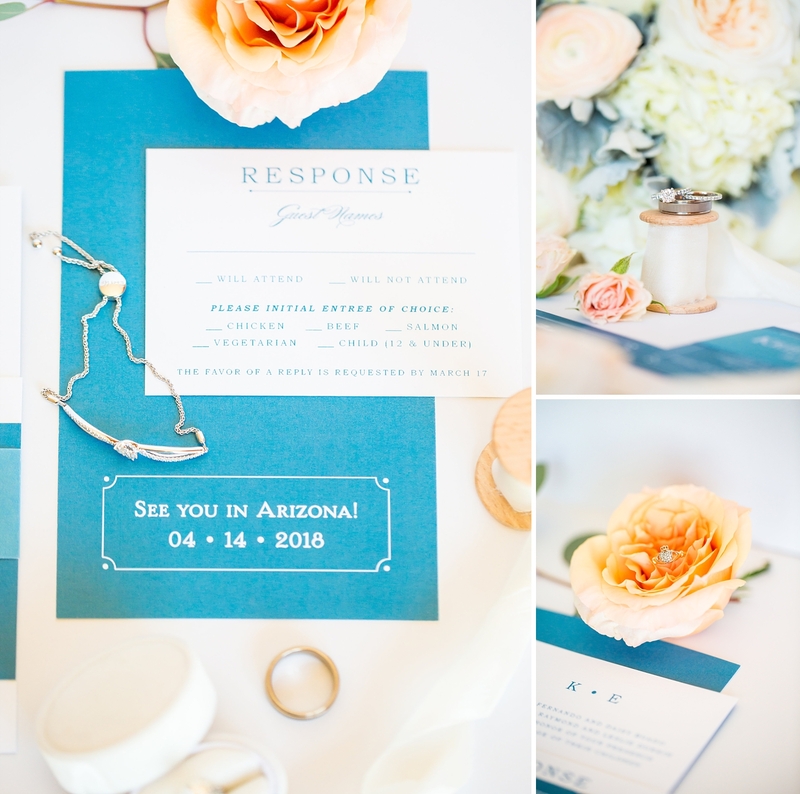 From the gorgeous curly willows in their reception centerpieces, soft peach roses, and fantastic romantic blue invites from MagnetStreet-—grab a look at every beautiful detail and hear more about their dazzling blue and peach wedding day! 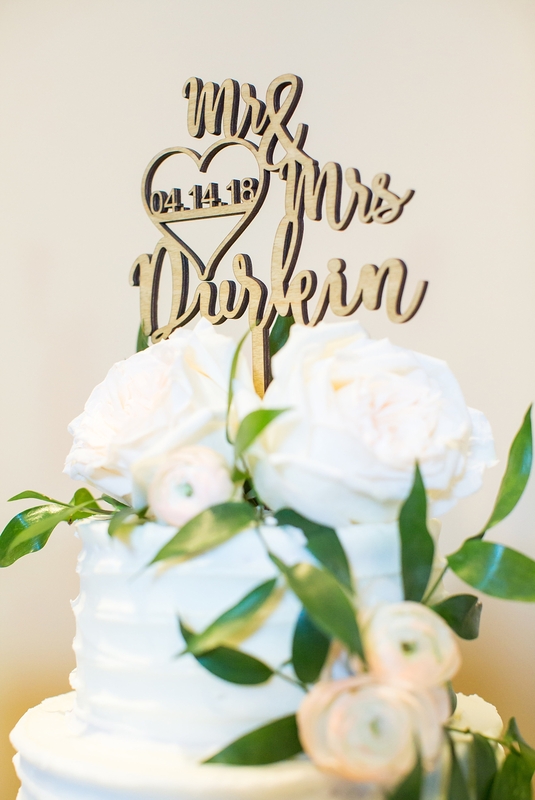 Tell us about your stunning wedding invites! 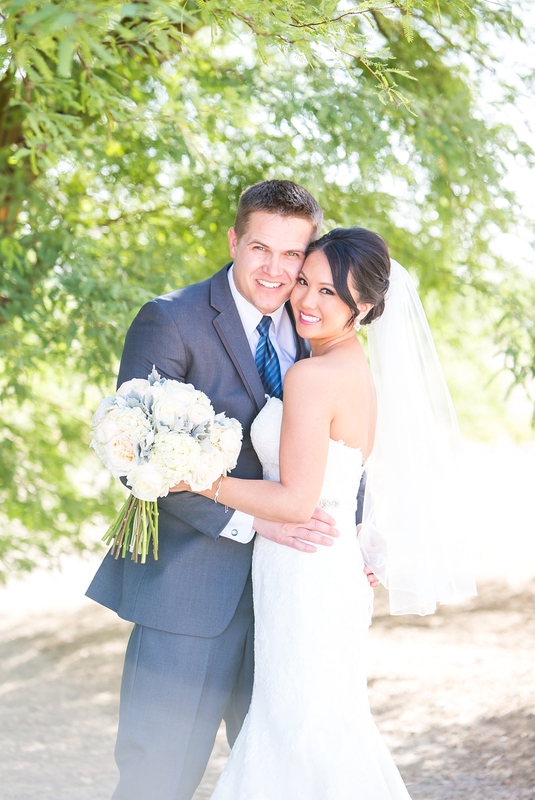 "I first found MagnetStreet through The Knot website. Originally I was looking local, then to the websites from what I've been introduced to by friends. However, the prices and the styles offered were just not a fit for me. When I stumbled upon MagnetStreet, I felt like I hit the jackpot. Beautiful, high quality stationery, options to personalize and edit the templates, the sample choices to get a solid idea of what you want, and the wonderful customer service - all for an affordable price! 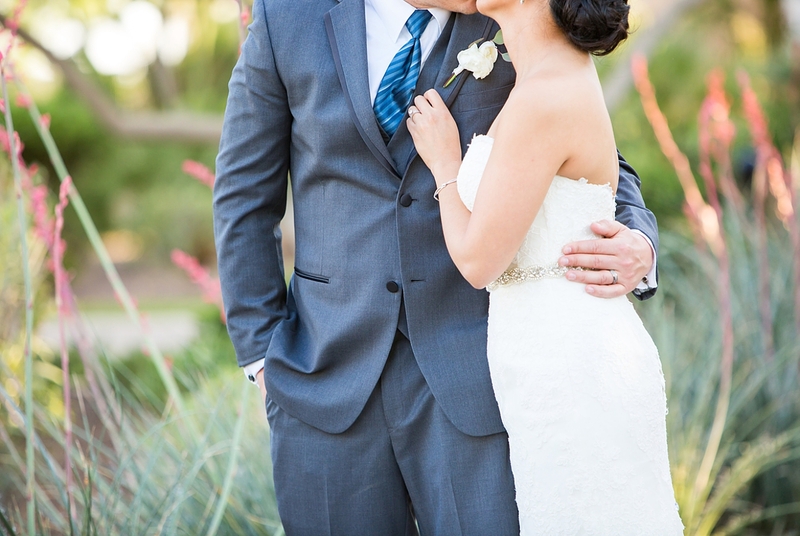 MagnetStreet was an easy and exciting choice to use for our wedding day." 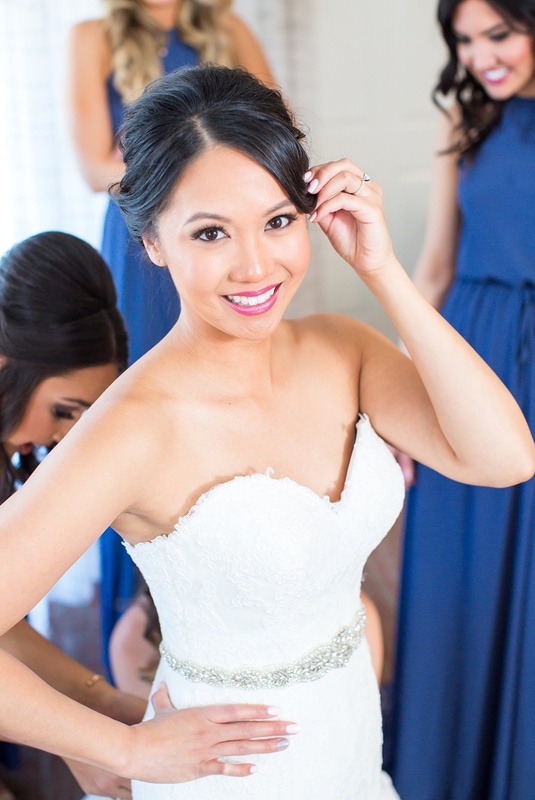 "I found my wedding dress in one day, surprisingly and I'm so happy I did. I'm one of three kids, two of which are my older brothers. My husband is one of two boys. Needless to say, my mom was very excited to go wedding dress shopping. Since we had invited Eric's parents out to Phoenix to meet my parents, I thought it would be a perfect opportunity to also invite his mom to join in on the experience and spend time with my mom and I. 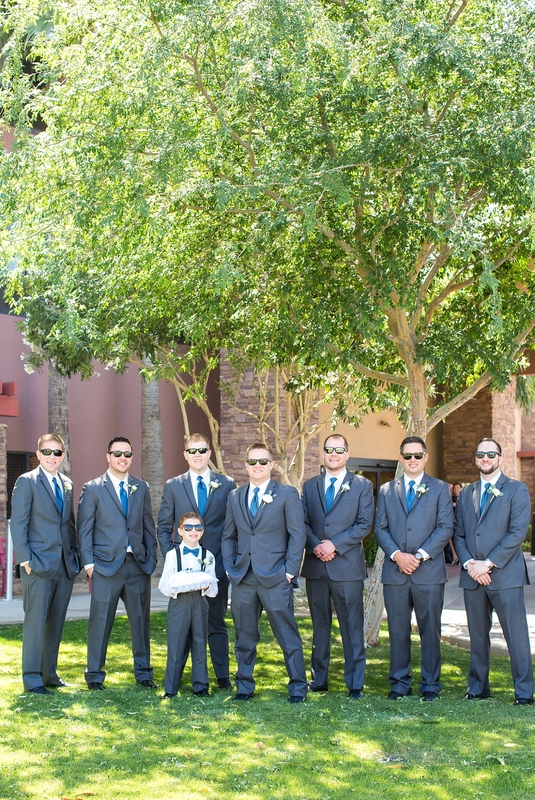 We went to David's Bridal first then to Schaffer's Bridal in Scottsdale. Although I was open and up for trying all sorts of dresses for some fun, I definitely gravitated to the same style. I was so torn between two dresses, I actually left the store with the moms to go get a snack, relax, and some perspective on the dresses. By the last bite of my cupcake, I knew which one I wanted. 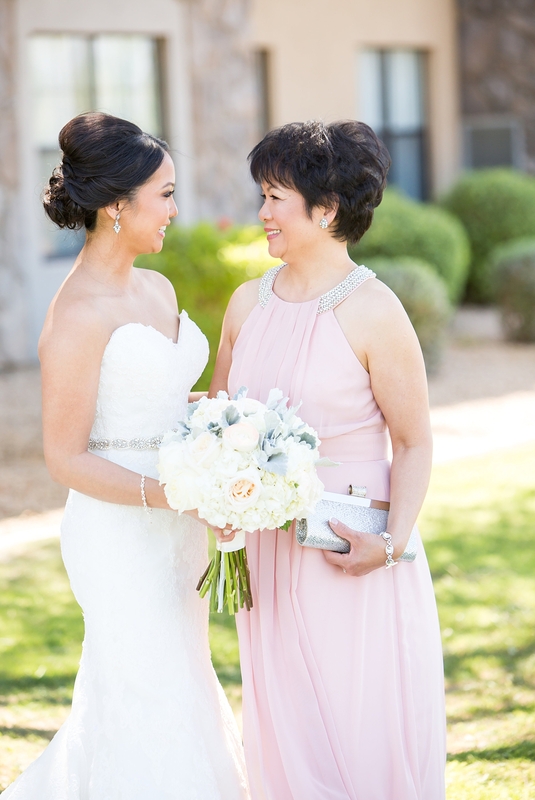 We went back into the bridal store, our consultant pulled out the two dresses, and when she pulled back the curtain my mom and Eric's mom saw which one I had picked, and by the looks on their faces, it was definitely the one." 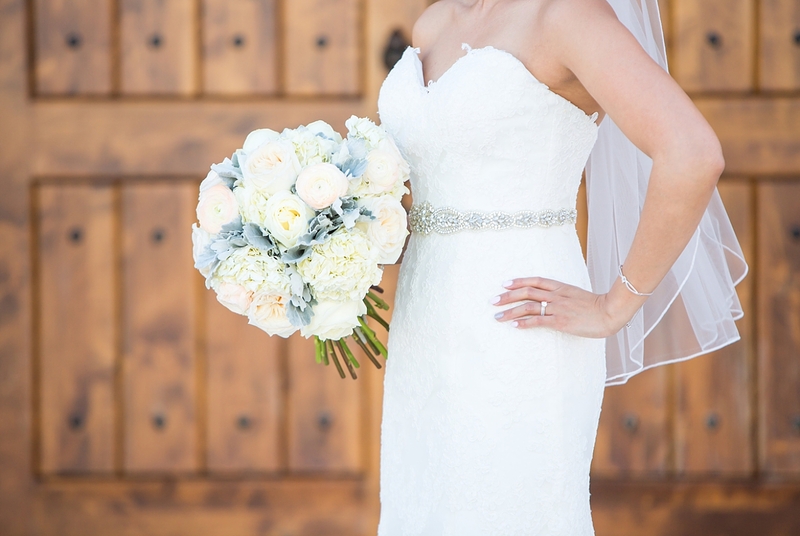 The white, cream, and soft peach bouquets and details are simple and elegant! 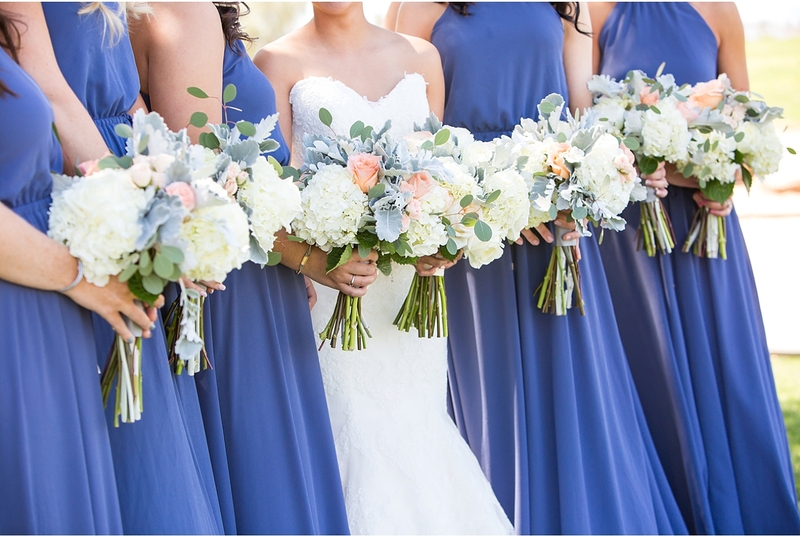 The bold color that added such a beautiful punch to their day was found in the bridesmaids' slate blue dresses. So pretty! 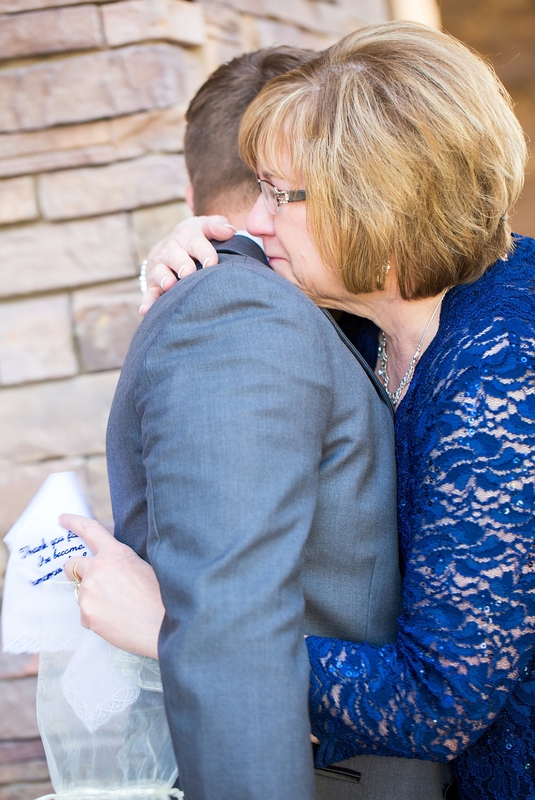 When Eric saw his mom after getting ready for the day, he presented her with an embroidered doily. The wording on it expressed his thanks for all she has done for him and how much he loves her. 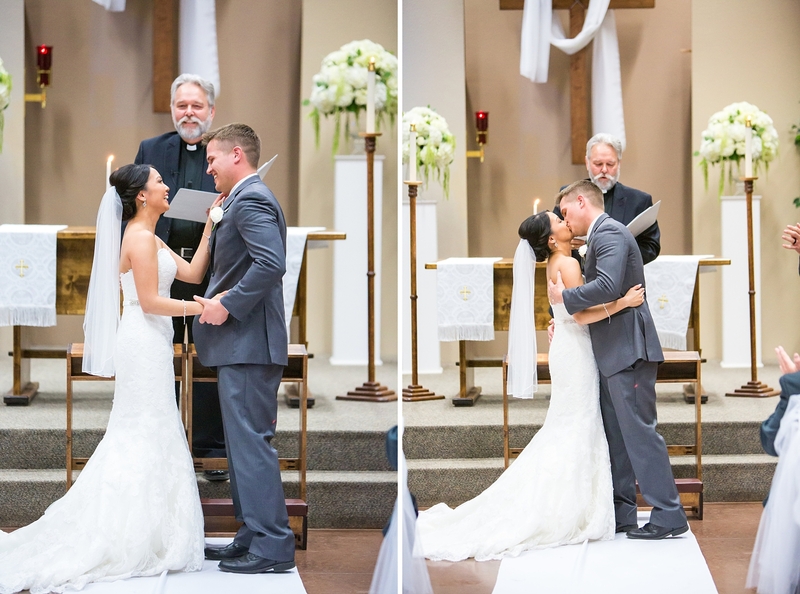 What a special moment ... definitely gives us the feels! How did Eric pop the question? "Our engagement was in my hometown of Chicago, Illinois. It was Eric's first time in the city and I was so excite to show him everything our beautiful city has to offer. One of the places was Millennium Park. It was winter time, so I had planned to try to get some ice skating in at night, but we got busy so we decided to go in the morning after a long night out. Let's just say, that had I known what was about to happen, I would've at least put make-up on that morning, ha ha. My brother was coming along to do some filming around the city (cover up!) and like any other day, we were all just walking around the city skyline. My brother wanted to set us up for a picture, and all of a sudden Eric got down on one knee. I was so surprised, I was in tears. I had never really thought about how he would propose, and it was a sweeter moment than I could have ever imagined. Plus with my brother there, we got it all on video to re-live this wonderful story." 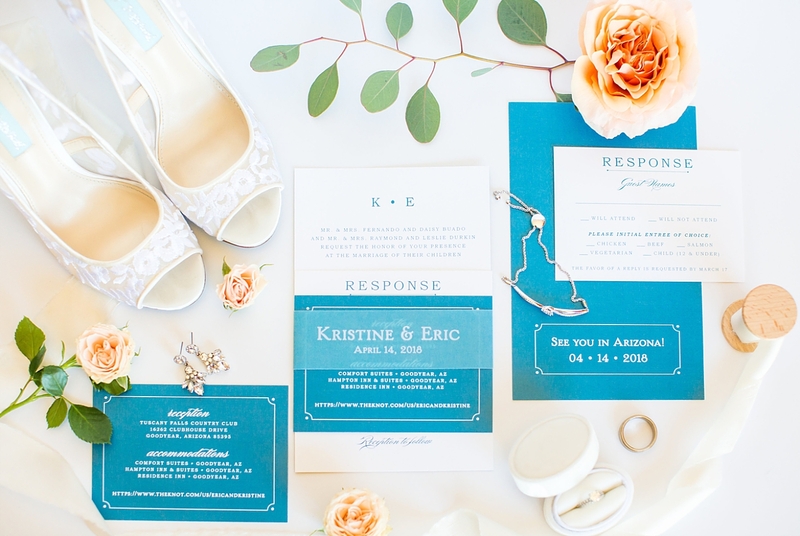 Their Grand Soiree wedding invitations from MagnetStreet were customized in a beautiful bright blue! 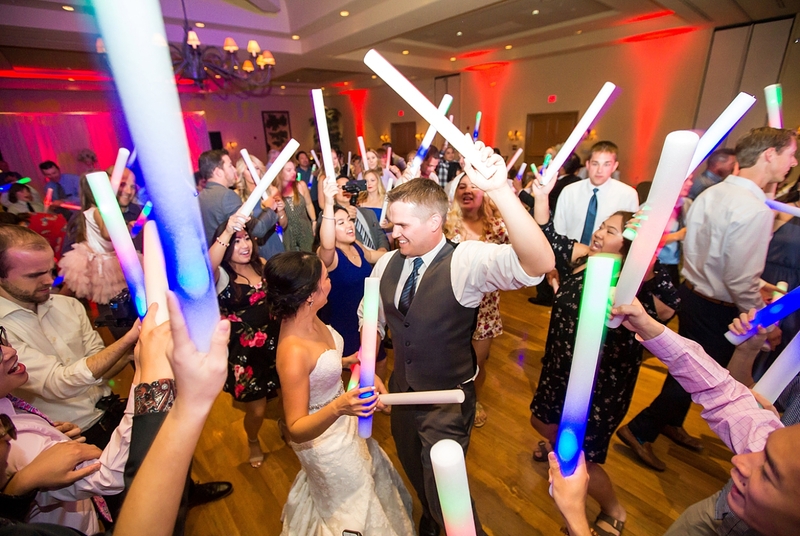 Besides getting married, what was a top highlight of the day? "The final song of the night was 'Piano Man.' Eric's family and friends tradition is to gather in a large circle, sing, and enjoy everyone's company. 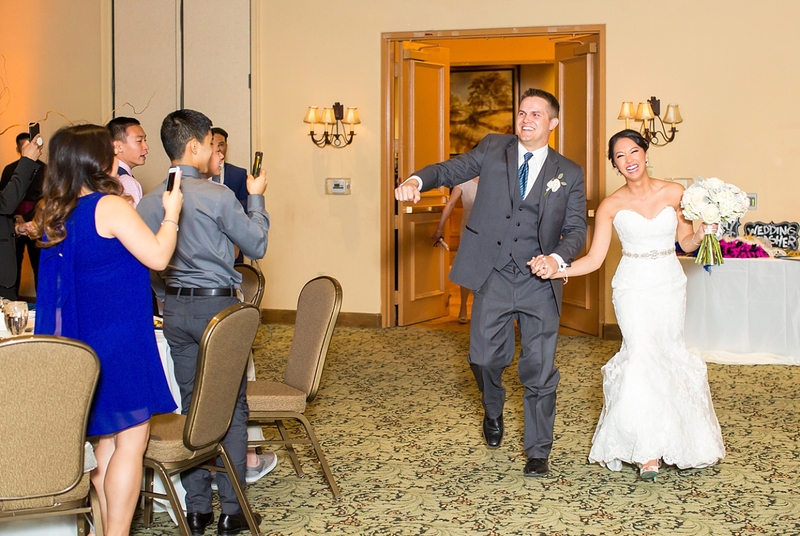 Eric and I ended up dancing in the middle of the large circle so we got to soak it all in. Seeing and being surrounded by all of our friends and family was a special moment we will never forget." 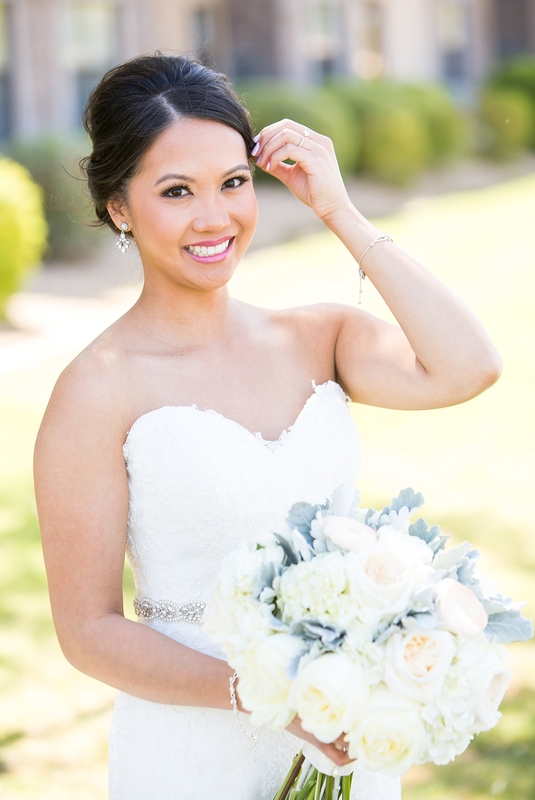 Any advice for brides planning their wedding? 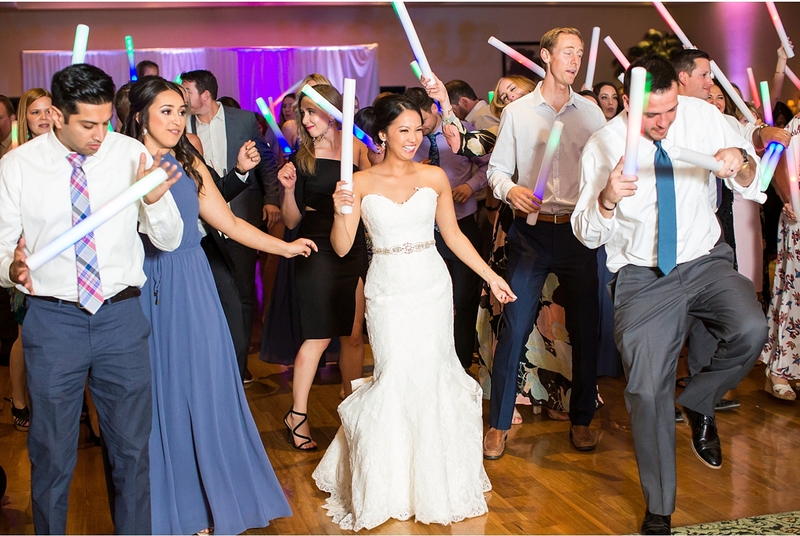 "Day-of wedding coordinators are a great investment - even just for the reception! 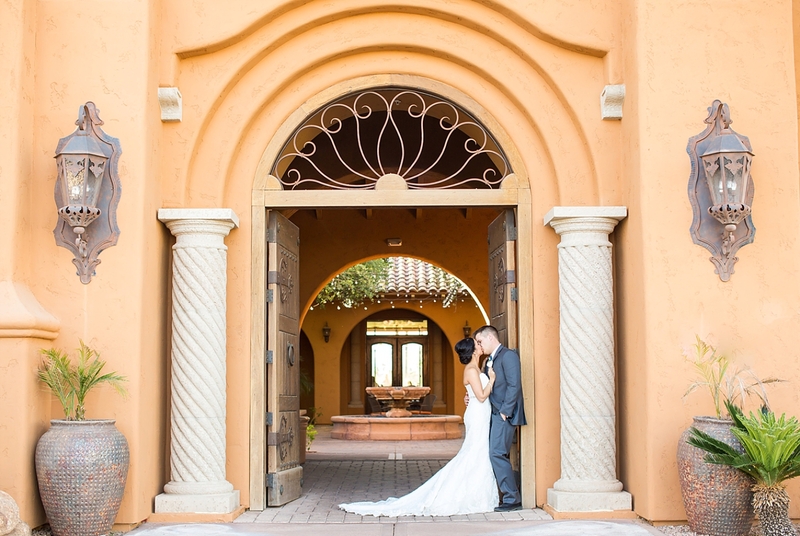 I didn't have to worry about a thing after the ceremony and during the reception, Crystal from Pebble Creek continually checked-up on us, coordinated with the other vendors to time out the events of the night, and just made everything go so smoothly. 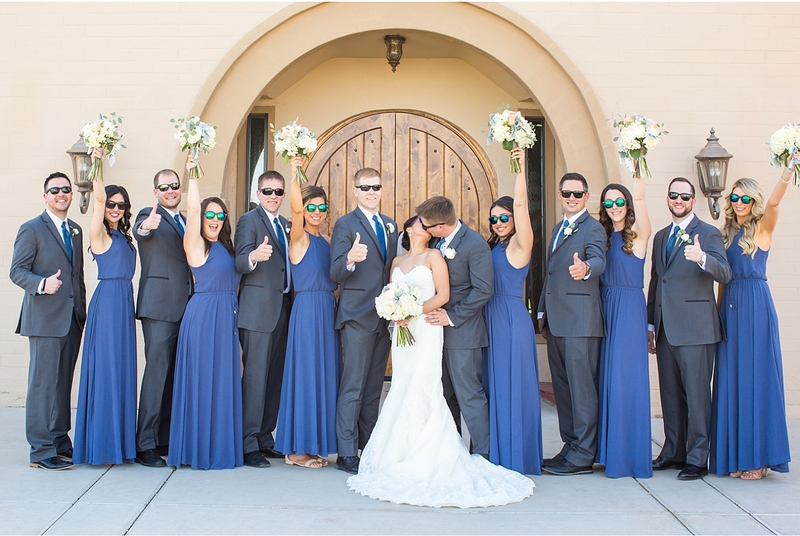 It's definitely possible to plan a wedding you're proud of on a budget! It might just take a lot of time up front sending e-mails, taking phone calls, reading reviews, and placing trust in the professionals you've chosen. Lastly, as everyone says - the day flies by, so take a moment to soak it all in, appreciate one another and your special day!" 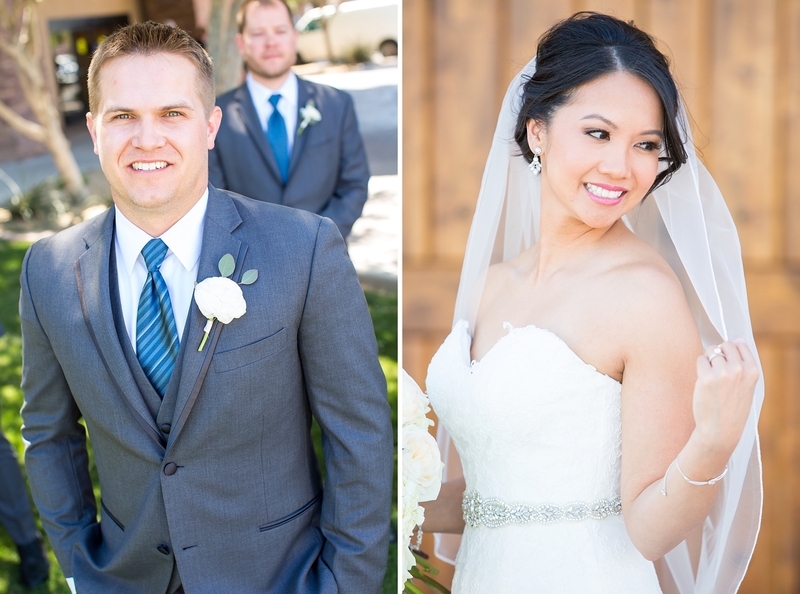 The following incredible vendors help put together Kristine and Eric's blue and peach wedding. Seriously, such talent! Submitted 7 months 4 days ago by Sarah.